Do you ever notice in polish collecting you go through bouts of an obsession with certain shades and need acquire as much of that shade as possible? Well, currently I'm going through a light-medium lavender/purple creme shade and a bright red creme shade phase. 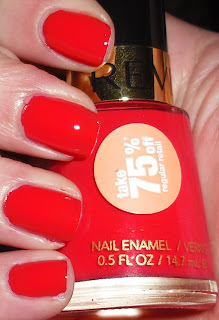 This is a Revlon polish I got in the midst of my bright red creme phase. It is currently 75% in their beauty sale which makes it really cheap! I don't know the price off hand but you shouldn't be paying more than $1.30 or so for it. Red Hot Tamale is a bright red-orange toned creme. What current shades are you obsessing over? I had the same light purple creme obsession last summer. It took a lot of tries to find the perfect colour but I finally got Revlon Gum Drop. Right now, I can't get enough taupes. Haha, i totally get what you mean! I'm totally obsessing over pale blue cremes right now and I always love bubblegum pinks! Love this red on you! I have to wear shades that red is so bright! Total awesomeness! Haha I totally know what you mean! I just bought ANOTHER dusty purple. Oh well, there'a always a good reason why you love a certain shade, eh?